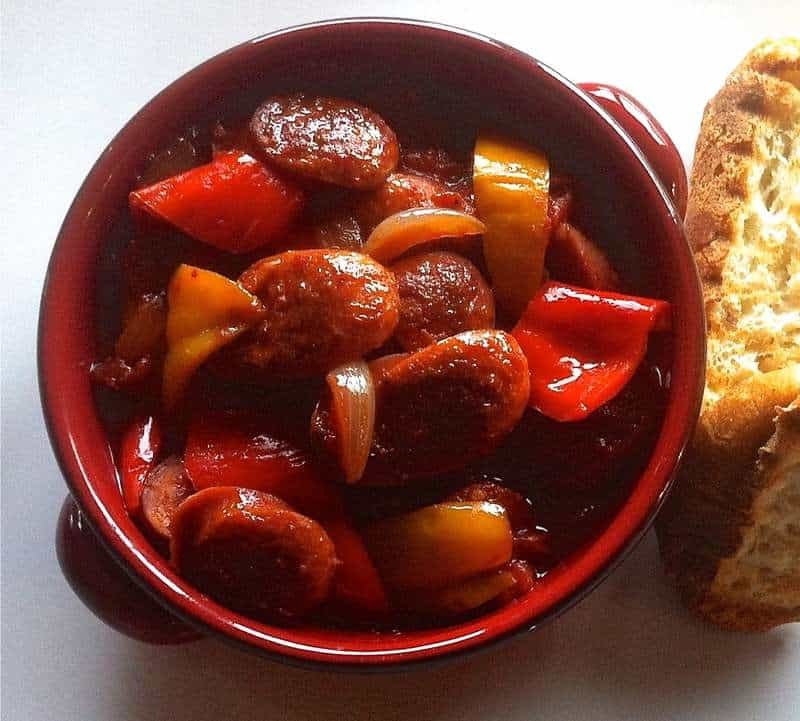 A rustic spicy Greek dish made with thick country sausages and peppers in a rich tomato sauce.. Perfect over a glass of red wine or tsipouro! Paired with salty kefalotyri cheese or tangy feta, lots of crusty bread, to dig in all the delicious sauce, it is guaranteed to warm you up during the cold winter’s days. Spetsofai is a Greek dish, one can find in many variations. The famous spetsofai from Pelio contains aubergines, while in most areas, it is prepared with green or multicoloured mild bell peppers, or spicy peppers hot enough to make your eyes tear! (If using mild sausages, spice it up with some red hot chilli peppers and hot paprika and be generous with the seasoning. If using spicy and salty sausages, then use mild peppers and watch out the seasoning.) Enjoy! To prepare this delicious Greek dish, place a saucepan over high heat, add one tbsp of olive oil and sauté the sausages, until nicely coloured. Remove with a slotted spoon and drain on some kitchen paper and leave them aside. Into the same pan, add the rest of the olive oil, the chopped onion and season with freshly ground pepper; sauté for a minute. Add the garlic and tomato puree and sauté for one more minute. Add the peppers and continue sautéing. Deglaze with the red wine, scraping the bottom of the pan, with all the delicacies, and wait for it to evaporate. Then add the sugar, the canned tomatoes, a cup of water, the herbs and spices, turn the heat down to medium and cook for 25-30 minutes with the lid on, until the peppers tenderise. Add the sausages and cook a little bit longer, until the sauce thickens. Check for seasoning; if you’re using too spicy or salty sausages, you’ll probably won’t need to add any salt or pepper. Serve while still hot with some crusty bread aside or as a main dish with basmati rice. Enjoy! What specifically are “Spicy Country Sausages”? What brand would I look for? I usually use hot, mild or sweet Italian sausage and throw the zest of half an orange into the sauce then jazz it up with some crushed red (pizza) pepper and a pinch of oregano. If you’re doing this in the US where sugar is generally added to canned tomatoes at the factory, I suggest leaving out the sugar, you can always add it later if you like. Leftover spetsofai also makes a KILLER sandwich on a toasted, hollowed-out, crusty, French roll or baguette! Be careful to not make it too sloppy with too much of the sauce, though. My family love this recipe.